What a beautiful image and urging by the voice. Yeeesss! Actions show who we are sometimes better than we can ever express verbally. I know right? It’s very powerful. I love quotes! If you ever need a quote from anyone ask me! Let me know if you want need more! Thanks! I’ll put something together soon and let you know when I post. Wow, K E thank you for this. It just helped me relax. 🙂 All I need to do is be the Light, and the rest flows from that. Have a wonderful rest of your day. Blessings! Thanks Alexis! It’s so simple, right? Came to me in the midst of arguing with someone and trying to prove my point. This makes me love the brilliance even more. Go K E!! Yes, very beautiful! I also love the way that you’ve adhered to the 5-7-5 (syllables) rule (makes me sound like an expert eh?) 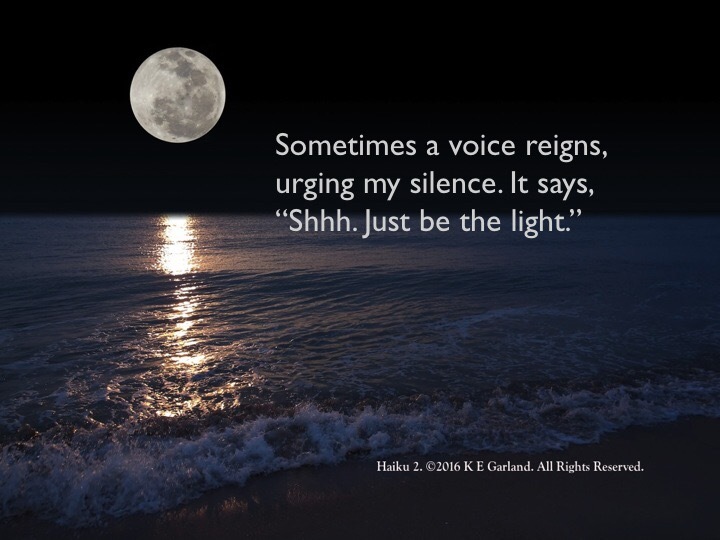 Sometimes releasing your will to your inner essence and being silent speaks more than you could ever say. You are an expert of Haikus 😉 Thanks for noticing. You know those rules are challenging. Most definitely it is sometimes better to just be quiet and let you (positive) actions do the talking. 🙂 🙂 I did an Open University (OU) short course and Haiku was on the syllabus. I’m by no means an expert, but I always like to give the impression that I am! 🙂 I obviously need to get out more! They say actions speak louder than words! Sorry to be preachy, but it’s also good to know when to speak up – there’s a very fine line between the two in my humble opinion. No apologies necessary here Marie. I agree. Sometimes speaking up is important. Beautiful – stillness in thiese words.